Call it a cliché, but the phrase ‘a pop of colour’ aptly describes AW13 trouser trends. Whilst coloured jeans and chinos started seeping into designers’ autumn/winter collections during 2012, there’s something different about the upcoming season – something bolder, brighter and more boisterous, causing any shirt or jacket to take a back seat. In a sense, an amalgamation of extremes composes many AW13 menswear collections. Runways at the global AW13 fashion weeks trotted out what can only be described as a ponderous hesitance – a return to the safety of black and white, albeit with some mild blue or tan added for variety. But then a red pair of trousers visually jumps out; within a collection, such a colour – blood orange, rust or even more traditional tones of burgundy – breaks up the barrage of predictability. It draws your eye before the next – eggplant, tangerine or mustard yellow – emerges and then diverts your attention again. This new emphasis on bold shades reflects an overall move in menswear toward confident experimentation. With a presence in AW13 collections from EXPRESS Men to Versace, this is one look that’s on the verge of ubiquity. These aren’t your ordinary blue jeans or stone chinos. For so long, trousers have been our outfit anchors – the unassuming backdrop to a floral shirt or plaid blazer. Expanding the colour palette opens a whole new Pandora’s Box of questions: what’s in style? What should I avoid? What should I pair with them? So prominent it might as well be considered its own trend, red trousers – whether in the form of blood orange, fire engine red, cherry, rust or maroon – were present in every style and material imaginable, from denim to velvet to vinyl. Red is one of those boundary-pushing, dare-I-wear-it shades commonly found in women’s collections but, save for your classic plaid flannel shirt, often absent from menswear. However, the sexiness and siren overtones in womenswear aren’t to be found here. Instead, red exudes confidence and shows you are not afraid of having all eyes on you. In line with an aesthetic and vibe similar to red, orange can be considered its toned-down cousin: bold but holding back, in-your-face but not to the point of obnoxiousness. Yet, unlike red, orange, depending how bright you go, has rave connotations. If you’re not an Ibiza season hold out, step away from the neon and instead opt for tangerine or burnt orange shades. If blue jeans tend to stay in the background, cobalt, cerulean, or ice/frosted shades won’t. Although equally eye-popping, it’s the yin to red’s yang: its near-pervasiveness in AW13 collections offers a cool, distinct and a bold alternative for the less-audacious man. Much like blue, purple ranges from the lightness of lavender to darker eggplant, with wine and royal shades in between. Although the colour is a visual merging of blue and red aesthetics, creating a bold but not garish look, the majority of AW13 collections lean towards the darker end of the scale. Save for pieces in Comme Des Garçons and similarly high-end collections, any incarnation of purple typically comes from a darker palette. For the man that’s looking to break out of the mould but finds red too gaudy and blue too plain, green is the answer. From forest shades to turquoise, the colour’s one of the trend’s more neutral and versatile options – complementing blue and yellow and tastefully contrasting with purple. If you see colour-blocking as a puzzle, with white and a warm shade as two pieces, green almost always completes it. Emerging with the intensity of a highlighter in 2012, the shade has been toned down by designers over the past year. Now, rather than looking like a garment taken off and thrown into the crowd at Tomorrowland, the colour offers better versatility and staying power. Mustard and butterscotch play off the coolness of blue, whilst goldenrod and brighter options offer the perfect contrast to black. Men’s trousers have thinned over the past few years, taking on a slimmer, silhouette-defining form. Whilst this trend meshes exactly with this now-standard cut, it’s not the only option out there. Going in the opposite direction, MAN, Topman and other menswear brands unveiled a more relaxed fit within their AW13 collections. On the flipside, hinting at a transitional trend, Carven, Comme Des Garçons and Dsquared2 combined bold hues with a cropped cut, with trousers finishing around the ankle or mid-calf. Along the same line of experimentation, Thierry Mugler and Paul Smith hiked up the waistline, creating a bright, almost tuxedo-esque look in the process. The AW13 colour palette expansion has coincided with greater material variety. Although cotton is and will be here to stay, selecting a pair of trousers isn’t a simple choice of ‘black, blue or red?’ anymore. Instead, based on AW13 collections, velvet, chenille, vinyl, shimmering or textured fabrics multiply all the stylistic possibilities. 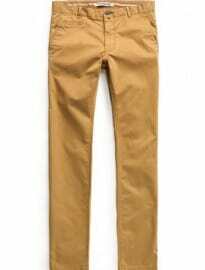 Although comfort plays a role to a certain degree, material defines the character of your chosen trousers. Cotton versions are perfect for the casual man looking for a bolder edge, whilst velvet hints at a dapper, dandy-like image, for instance. There are two distinct ways to style bold coloured trousers this year, regardless of whether you’re aiming for casual or smart. The easiest – at least, in terms of how any of these pieces could fit into your existing wardrobe – is colour-blocking. Own a white, black or other solid, neutral shirt? Then half of your stylistic journey is pretty much over. Save for a blazer or jumper added to the mix, the shades selected may tastefully contrast, think green and white or red and black, or complement each other, like green with blue. On the other hand, tonal dressing is an emerging trend. Although a suit makes this easy to pull off (and can be found in practically any colour for AW13), formal wear isn’t its sole domain; try pairing a shirt/polo/tee with jeans/chinos in varying shades of the same base colour. With a more experimental, diverse vision of menswear coming to the fore, it was only a matter of time before the kaleidoscope of colours we traditionally associate with the spring/summer months transitioned through to autumn/winter. 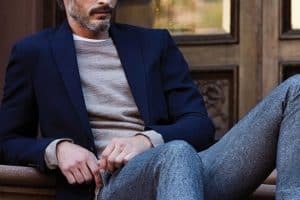 Although certain looks (like vinyl red pants, for instance) will only exist within the realm of high fashion, the greater coloured trousers trend is one any man can try – from the one staunchly entrenched in his casual wardrobe to the fashion forward, dapper gentleman with discerning tastes. Are you an advocate of bold coloured trousers during autumn/winter? Or should they be confined to the spring/summer months? Will you be investing in a pair of coloured trousers this year? If so, what is your colour and texture of choice?